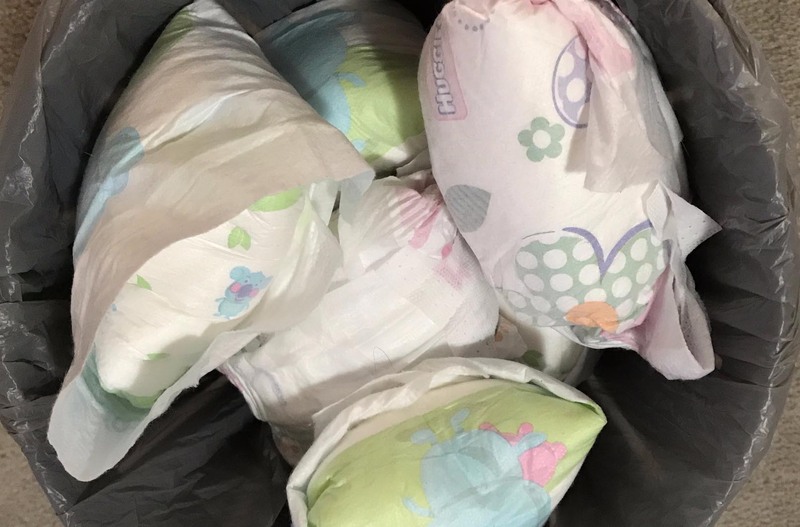 <h2>Scientists want to use dirty nappies as a source of raw materials</h2><br /><p>Every day, new parents find themselves sucked into the environmentally controversial disposable nappy cycle. Tens of billions of these clusters of plastic, plant matter and human waste are thrown away globally each year, most of them incinerated or sent to landfill where they take centuries to decay.</p> <p>Yet buried in each used nappy are hidden treasures, according to Marcello Somma, who is head of research and development at Fater, an Italian joint venture between Procter &amp; Gamble and Angelini Group.</p> <p>Fater has developed what it claims is the first industrial-scale process that can extract these valuable materials, and it is already up and running in Treviso, Italy. Now, as part of a project called <a href="https://cordis.europa.eu/project/rcn/210294_en.html">EMBRACED</a>, it is building a biorefinery next door to make best use of these recycled substances.</p> <p> <div class="quote-view quotesBlock quote_horizontal"> <div class="quotesTop"><img src="https://horizon-magazine.eu/sites/all/themes/horizon/images/quotes_top.png" alt="" title="" /></div> <p>‘When you change a nappy you wrap it onto itself and so basically you have a kind of bomb of four waste types intimately linked with each other.’</p> <blockquote><p>Marcello Somma, Head of Research and Development, Fater</p></blockquote> <div class="quotesBottom"><img src="https://horizon-magazine.eu/sites/all/themes/horizon/images/quotes_bottom.png" alt="" title="" /></div> </div> </p> <p>Technical minds have been trying to recycle nappies since 1992, says Somma, but it has proved to be a ball of trouble.</p> <p>‘When you change a nappy you wrap it onto itself and so basically you have a kind of bomb of four waste types intimately linked with each other,’ says Somma. ‘There is plastic waste – polyethylene and polypropylene, paper waste – because there is cellulose, a super-absorbent polymer and the organic fraction – the human contribution.’</p> <p>Fater, which has been trying to recycle disposable nappies for a decade, has found the trickiest stage is at the start: opening it.</p> <p>Conventional approaches such as high temperatures and pressures only make it collapse on itself, Somma says.</p> <p>But, ten years and 108 patents later, Fater has found a way to relax the nappy so it opens up and can be sterilised and dried, ultimately yielding its constituent parts. The plant also processes incontinence and sanitary pads and tampons.</p> <p><strong>Higher quality</strong></p> <p>The plastic stream that emerges is of a higher quality than much recycled plastic on the market, created as it was ‘to be extremely thin, be elastic and be compatible with the most delicate skin,’ said Somma.</p> <p>Another reason for the quality is that collected nappies are generally uncontaminated with other waste – a problem that plagues the plastics recycling industry.</p> <p>This is because in parts of Italy nappies are collected separately and ‘the nappy bin is much purer and more homogeneous in composition than the average waste bin’.</p> <p>As a result, while the recycled nappy plastic is currently used to make bottle tops and coat hangers, the group is hoping to develop markets for more demanding applications such as blow moulding, and injection moulding to make objects such as display materials, pallets and, in a further nod to the circular economy, used nappy bins.</p> <p><img class="@alignleft@" title="If just half of the 14 million babies under two in the EU use an average of 5 nappies a day, the line of folded and used nappies would measure over 3,200 km. 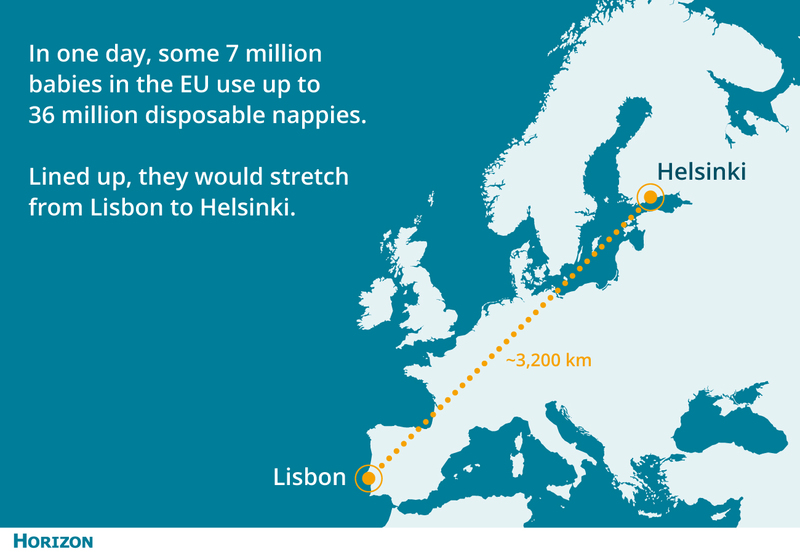 Image credit - Horizon" src="https://horizon-media.s3-eu-west-1.amazonaws.com/s3fs-public/IMCEUpload/DirtyNappies.jpg" alt="If just half of the 14 million babies under two in the EU use an average of 5 nappies a day, the line of folded and used nappies would measure over 3,200 km. Image credit - Horizon" width="1300" height="900" /></p> <p>It is with an eye to making better use of the other waste streams that EMBRACED has begun. The partners on the project – drawn from all stages of the process – want the biorefinery to extract nutrients from the faeces and urine in the waste water, for example, which could be used for fertiliser.</p> <p>But the prize will be harnessing the cellulose. Originally designed to snuggle near a baby’s bottom, it is high quality, soft and free from the lignin that is a challenge for other biorefineries trying to make use of cellulose waste streams from sources such as wood pulp.</p> <p>As a bonus, the cellulose emerging from the recycling plant turns out to be more yielding even than virgin cellulose to the fate that awaits it. For example, the recycling process renders it more vulnerable to enzymes that break it down into glucose ready for fermentation into ethanol.</p> <p>The project is investigating two schemes: turning the cellulose into a feedstock for the manufacture of biodegradable polymers that could ultimately be used to package some of Fater’s products, and making biostimulants, part of the new generation of more environmentally friendly fertilisers.</p> <p>It will produce the latter through a two-stage process. First the cellulose will be heated to a high temperature without oxygen so that it breaks down into simple gases such as hydrogen and carbon monoxide. Then, this so-called syngas is fed to bacteria for metabolising into bioplastics for medical devices, with the deactivated bugs destined for biofertiliser.</p> <p>If things go well, an industrial scale biorefinery will be built in Amsterdam by 2020.</p> <p>But could Fater ever achieve the crowning goal of the circular economy – turning the materials into new nappies?</p> <p>‘That’s my dream, we are not yet there yet, though,’ said Somma.</p> <p>Given these efforts, wouldn’t it be greener to switch to reusables instead? This is the vision of a cooperative called Femmefleur, at least when it comes to menstrual products. The small team, made up of two architects, a graphic designer and a linguist, were frustrated at the environmental toll caused by the 1 million tonnes of pads and tampons discarded in Europe each year.</p> <p><img class="@alignleft@" title="Frustrated at the 1 million tonnes of pads and tampons that get discarded every year, cooperative Femmefleur created a line of reusable menstrual wear. Image credit - Cocoro" src="https://horizon-media.s3-eu-west-1.amazonaws.com/s3fs-public/IMCEUpload/cocoro_0.jpg" alt="Frustrated at the 1 million tonnes of pads and tampons that get discarded every year, cooperative Femmefleur created a line of reusable menstrual wear. Image credit - Cocoro" width="1600" height="532" /></p> <p>The team felt the answer lay in making ordinary underwear more absorbent. The result? Menstrual pants. Thanks to a project called <a href="https://cordis.europa.eu/project/rcn/206539_en.html">COCORO</a>, they were able to hone their product into fashionable-looking lingerie that ticks all the boxes: absorbent, breathable and washable.</p> <p><strong>Attract</strong></p> <p>The absorbent part consists of layered cotton and polyester materials, treated with an ‘innovative technology’ that causes the bottom layer to repel moisture and the top layer to attract it.</p> <p>‘The layer that’s in touch with the body is cotton, which is the tissue that gynaecologists recommend,’ said co-director Clara Guasch.</p> <p>The team also used their funding, which finished in 2017, to conduct a feasibility study and make a business plan. FemmeFleur crowdfunded its marketing stage, raising €170,000 (eight times its original goal) from women prepared to pay for the product upfront.</p> <p>‘We were really taken aback … we could see that there was a big interest and that was the beginning of the marketing,’ said Guasch.</p> <p>Femmefleur has faced many challenges, including the burden of introducing the public to what for many is a new product, not just a new brand.</p> <p>‘I believe that when the product category is better-known it will be easier,’ said Guasch. ‘We thought we would have to deal with more reluctance but women are interested. First they imagine some horrible thing but then when they see it, it generally has great acceptance.’</p> <p><em>The research in this article was funded by the EU. If you liked this article, please consider sharing it on social media.</em></p> <br /> <img src=”http://www.google-analytics.com/collect?v=1&tid=UA-40077089-1&cid=scientists-want-to-use-dirty-nappies-as-a-source-of-raw-materials&t=event&ec=republish&ea=read&el=scientists-want-to-use-dirty-nappies-as-a-source-of-raw-materials&cs=republish&cm=republish&cn=republish&cm1=1" /> This post <a href="https://horizon-magazine.eu/article/scientists-want-use-dirty-nappies-source-raw-materials.html">Scientists want to use dirty nappies as a source of raw materials</a> was originally published on <a href="https://horizon-magazine.eu/">Horizon: the EU Research &amp; Innovation magazine | European Commission</a>. Thousands of soiled nappies that were destined to clog Italian landfill sites or incinerators are being redirected to a recycling plant that is turning them into streams of high quality raw materials, in a new process that it is hoped will be replicated around Europe. Every day, new parents find themselves sucked into the environmentally controversial disposable nappy cycle. Tens of billions of these clusters of plastic, plant matter and human waste are thrown away globally each year, most of them incinerated or sent to landfill where they take centuries to decay. Yet buried in each used nappy are hidden treasures, according to Marcello Somma, who is head of research and development at Fater, an Italian joint venture between Procter & Gamble and Angelini Group. Fater has developed what it claims is the first industrial-scale process that can extract these valuable materials, and it is already up and running in Treviso, Italy. Now, as part of a project called EMBRACED, it is building a biorefinery next door to make best use of these recycled substances. Technical minds have been trying to recycle nappies since 1992, says Somma, but it has proved to be a ball of trouble. Fater, which has been trying to recycle disposable nappies for a decade, has found the trickiest stage is at the start: opening it. Conventional approaches such as high temperatures and pressures only make it collapse on itself, Somma says. But, ten years and 108 patents later, Fater has found a way to relax the nappy so it opens up and can be sterilised and dried, ultimately yielding its constituent parts. The plant also processes incontinence and sanitary pads and tampons. The plastic stream that emerges is of a higher quality than much recycled plastic on the market, created as it was ‘to be extremely thin, be elastic and be compatible with the most delicate skin,’ said Somma. Another reason for the quality is that collected nappies are generally uncontaminated with other waste – a problem that plagues the plastics recycling industry. This is because in parts of Italy nappies are collected separately and ‘the nappy bin is much purer and more homogeneous in composition than the average waste bin’. As a result, while the recycled nappy plastic is currently used to make bottle tops and coat hangers, the group is hoping to develop markets for more demanding applications such as blow moulding, and injection moulding to make objects such as display materials, pallets and, in a further nod to the circular economy, used nappy bins. It is with an eye to making better use of the other waste streams that EMBRACED has begun. The partners on the project – drawn from all stages of the process – want the biorefinery to extract nutrients from the faeces and urine in the waste water, for example, which could be used for fertiliser. But the prize will be harnessing the cellulose. Originally designed to snuggle near a baby’s bottom, it is high quality, soft and free from the lignin that is a challenge for other biorefineries trying to make use of cellulose waste streams from sources such as wood pulp. As a bonus, the cellulose emerging from the recycling plant turns out to be more yielding even than virgin cellulose to the fate that awaits it. For example, the recycling process renders it more vulnerable to enzymes that break it down into glucose ready for fermentation into ethanol. The project is investigating two schemes: turning the cellulose into a feedstock for the manufacture of biodegradable polymers that could ultimately be used to package some of Fater’s products, and making biostimulants, part of the new generation of more environmentally friendly fertilisers. It will produce the latter through a two-stage process. First the cellulose will be heated to a high temperature without oxygen so that it breaks down into simple gases such as hydrogen and carbon monoxide. Then, this so-called syngas is fed to bacteria for metabolising into bioplastics for medical devices, with the deactivated bugs destined for biofertiliser. If things go well, an industrial scale biorefinery will be built in Amsterdam by 2020. But could Fater ever achieve the crowning goal of the circular economy – turning the materials into new nappies? ‘That’s my dream, we are not yet there yet, though,’ said Somma. Given these efforts, wouldn’t it be greener to switch to reusables instead? This is the vision of a cooperative called Femmefleur, at least when it comes to menstrual products. The small team, made up of two architects, a graphic designer and a linguist, were frustrated at the environmental toll caused by the 1 million tonnes of pads and tampons discarded in Europe each year. The team felt the answer lay in making ordinary underwear more absorbent. The result? Menstrual pants. Thanks to a project called COCORO, they were able to hone their product into fashionable-looking lingerie that ticks all the boxes: absorbent, breathable and washable. The absorbent part consists of layered cotton and polyester materials, treated with an ‘innovative technology’ that causes the bottom layer to repel moisture and the top layer to attract it. ‘The layer that’s in touch with the body is cotton, which is the tissue that gynaecologists recommend,’ said co-director Clara Guasch. The team also used their funding, which finished in 2017, to conduct a feasibility study and make a business plan. FemmeFleur crowdfunded its marketing stage, raising €170,000 (eight times its original goal) from women prepared to pay for the product upfront. ‘We were really taken aback … we could see that there was a big interest and that was the beginning of the marketing,’ said Guasch. Femmefleur has faced many challenges, including the burden of introducing the public to what for many is a new product, not just a new brand.